Introduced and named in 1978, Magnolia ‘Elizabeth’ was a breakthrough in the quest for a yellow-flowering magnolia. While ‘Elizabeth’ is creamy white with subtle hints of yellow, the cultivar opened the door for subsequent introductions that feature bright yellow, golden-yellow, and orange flowers. Patented by the Brooklyn Botanic Garden, ‘Elizabeth’ is a hybrid between M. acuminata and M. denudata. The hardiest of the magnolia species, M. acuminata can be found from Lake Erie in Canada through western New York and south to Oklahoma, Louisiana, and Northern Florida. The species has a wide distribution in part to its ability to thrive in a wide range of soils; however, it is not drought tolerant. In the wild the tree is often found alongside sugar maple and white oak in deep, moist soils. Magnolia acuminata bears ovate green leaves, slightly downy on the underside, particularly so along the mid-vein. The plant gets its specific name, “acuminate” from the leaf shape, which tapers to a point at the apex. Small flowers, 3 – 4 inches, are held erect and range in color from blue-green to yellow. A distinctly yellow form, Magnolia acuminata f. aurea can be found in the southeastern United States and was considered the key to unlocking yellow flowering hybrids and cultivars. In Magnolias A Gardeners Guide, author Jim Gardiner explains that in addition to yellow flowers, M. acuminata was used in breeding in the hopes that it would pass along other desirable qualities including cold hardiness, tolerance to a range of soil conditions, variable habit (tree form to multi-stem shrub), and “clean” green foliage. 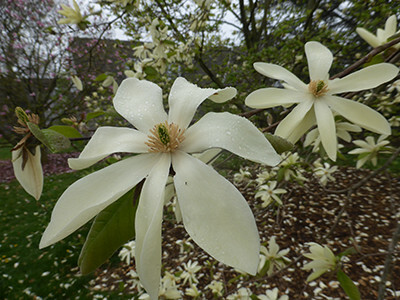 Brooklyn Botanic Garden led the way in breeding for yellow flowering magnolias. The first yellow, ‘Elizabeth’, named in honor of Elizabeth van Brunt, a Brooklyn Botanic Garden patron, bears flowers comprised of six to nine tepals. The best, most intense color is seen on the first flowers to open. ‘Judy Zuk’ is the most intensely colored of the yellow flowering varieties with tones that edge toward orange. Named after the former president of the Brooklyn Botanic Garden and former director of the Scott Arboretum, ‘Judy Zuk’ is an upright small tree. Golden-orange tulip-shaped flowers are held upright and produce a fragrance akin to Fruit Loops cereal. If I could have only one yellow flowering cultivar, it would be ‘Lois’. A small tree with a wide, round canopy, ‘Lois’ produces a multitude of compact deep, clear-yellow flowers. Individual flowers last longer than other varieties allowing for a longer floral display. A tree in full bloom is a sight to behold. Named in honor of Lois Carswell, former chairman of the Brooklyn Botanic Garden Board of Directors, M. ‘Lois’ was an Award of Garden Merit winner in 2012. ‘Yellow Bird’, another Brooklyn Botanic Garden introduction registered in 1981, is an upright pyramidal-shaped tree sporting daffodil-yellow flowers each with six tepals. ‘Yellow Lantern’ grows as an upright, single-trunked, pyramidal to oval tree that matures to 25-30’ tall. Lightly fragrant, tulip-shaped, creamy yellow flowers bear light pink tinges at the base. ‘Anilou’ is the result of breeding work of Dr. August Kehr in which Magnolia acuminata was crossed with Magnolia ‘Elizabeth’. Cultivated and selected by Philippe de Spoelberch and named in honor of his sister, ‘Anilou’ produces deep yellow flowers. The outer tepals bear shades of green that fade with age. Flowers are borne over the span of a month, usually beginning in mid-April. ‘Green Bee’ is another Dr. August Kehr hybrid raised and introduced by Phillipe de Spohlberch for its lemon-lime flowers. The tepals become yellower with maturity and have a luminescent quality about them. Yet another introduction by Phillipe de Spoelberch, ‘Olivia’ is a sister seedling of the much admired ‘Dahpne’. More fastigiate in growth, ‘Olivia’ has space between each tepal giving the appearance of a larger flower. The yellow magnolias are in their full glory. To find specific varieties and their location on campus, use Arboretum Navigator from any electronic device. Enjoy! Great information/images, thank you. Have planted three ‘Elizabeth’s in eastern Massachusetts (z5 &6) all fast growing, no snow damage in 12 yrs, and extremely prolific flowering. Highly recommend. But now on to some of your beauties. I am starting to like yellow magnolias! Great post! Thanks for sharing!